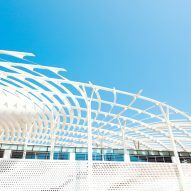 A sweeping canopy made from angled aluminium fins helps to shade terraces and the concrete-walled halls of this fish market designed by Snøhetta for the city of Muttrah in Oman. 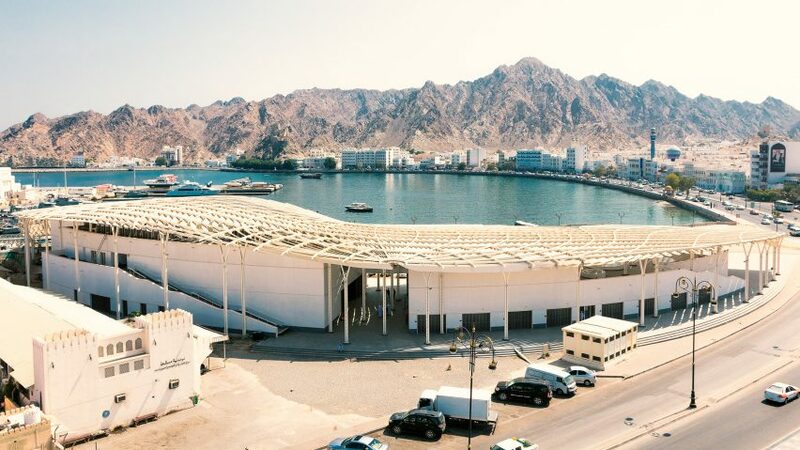 The building is located close to the Muttrah's original fish market, which was built in 1960, and was created by Snøhetta to provide a more contemporary facility for traders and tourists. Muttrah is located in the Muscat province on the coast of the Gulf of Oman, and was traditionally the Arab country's centre of commerce due to its important sea port. The port remains the largest in Oman and is a hub for shipping, fishing and cruise liners. Snohetta's design seeks to create a new landmark that is in keeping with the harbour city's rich history. 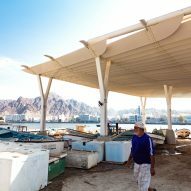 "The Muttrah Fish Market is created to serve as a focal point for the community of Muttrah, while simultaneously functioning as a hub for Oman's thriving fishing industry," said the studio, which has offices in both Oslo and New York. "Merging tradition with innovation, the market is designed to sympathetically unite the old and the new." The 4,000-square-metre facility comprises a series of indoor and outdoor spaces intended to meet the needs of both local fishermen and tourists visiting the city. The building's curving form is based on the natural sweep of the corniche and its double-walled structure appears to continue the curve of the bay. "Referencing both the former waterfront and the continuation of the corniche, the fish market defines the boundaries of public space, interconnecting the city, the mountains, and the waterfront," said the architects. Staircases positioned along the outer walls help to enhance the relationship between the building and the street, while an opening approximately at the centre invites visitors to enter. 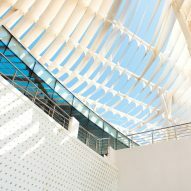 The structure is topped with a canopy formed of metal fins that radiate out to create a dynamic surface influenced by the fluid lines of traditional Arabic handwriting. "The canopy's form is derived from the sinuous flow of Arabic calligraphy," said Snøhetta, which is ranked at number 27 in the 2017 Dezeen Hot List. 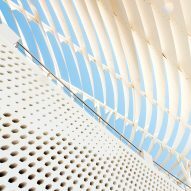 "It follows the logic of a playful movement of light and shadow built from aluminium fins which provide shade, natural ventilation, and an ephemeral appearance." The louvred surfaces contrast with the solid mass of the concrete volumes below. They provide shade to public spaces at street level, as well as large roof terraces overlooking the bay. Hexagonal perforations applied to the concrete walls of the market halls allow natural light and ventilation to reach the interior, which accommodates more than 100 fish sellers and cutters. A new market for fruit and vegetables is also contained within the building, which offers refrigeration, packaging and storage facilities alongside offices, cafes and a rooftop restaurant. Snøhetta was in the news towards the end of 2016 following its proposal to overhaul an iconic postmodern skyscraper in New York, which prompted several campaigns and protests. The firm has also recently completed a store for Aesop inspired by Brazilian modernist Oscar Niemeyer, and has unveiled plans for a restaurant that is partly submerged in the sea. Snøhetta unveils plans for "Europe's first underwater restaurant"